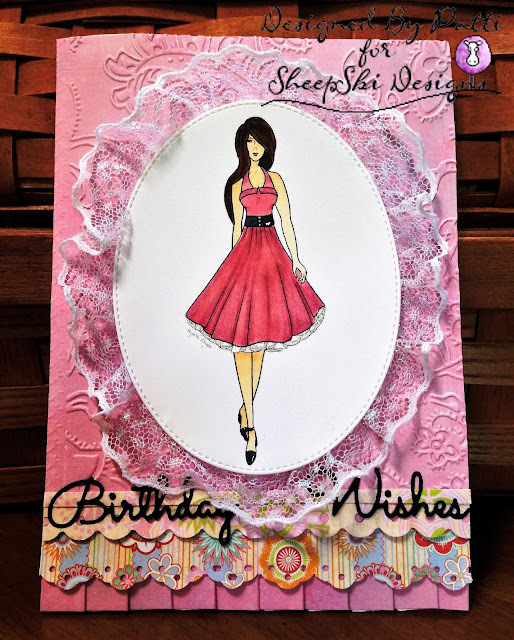 Celebrating the joy of creativity and papercrafts! Hi Friends: It's time for a new challenge over at the SheepSki Designs Challenges Blog! The theme for this month is Think Pink. Here's my project for this month's challenge - I used this gorgeous digital stamp called 50's Chic from SheepSki Designs. I used Glossy Accents on her belt and shoes to make them look like patent leather - I love the way it looks in person! And I used the lace and the pleated paper and border punches to mimic the elements of her dress. This was fun! I hope that you are inspired by my project - instructions and supplies are listed below. Come have some fun with a hand-colored image and join us for this month's challenge! As long as you follow the challenge rules, you are eligible for prizes! For inspiration, stop by the blog and see all of the great design-team projects for the challenge. You can also join in the Facebook challenges in the SheepSki Designs Digital Stamps Facebook group. If you love the SheepSki digis as much as I do, use this code for a discount when ordering: SKIPATTI10. Happy stamping and coloring! Print image onto smooth white cardstock and color with Spectrum Noir markers. Cut with stitched oval die. Add Glossy Accents to shoes and belt. When dry, add lace behind the oval. For the A7 card base, cut patterned papers to card size, with 1/2 inch to 1 inch stips for the borders. Use embossing folder on the large top panel and glue to card base. Box pleat the bottom panel and adhere. Use punches on 2 strips of patterned paper and layer over the box pleat panel. Use foam squares to add dimension to the focal image and adhere to card. Cut sentiment from black cardstock and glue to card. I read all of your comments and truly appreciate them! Thank you.